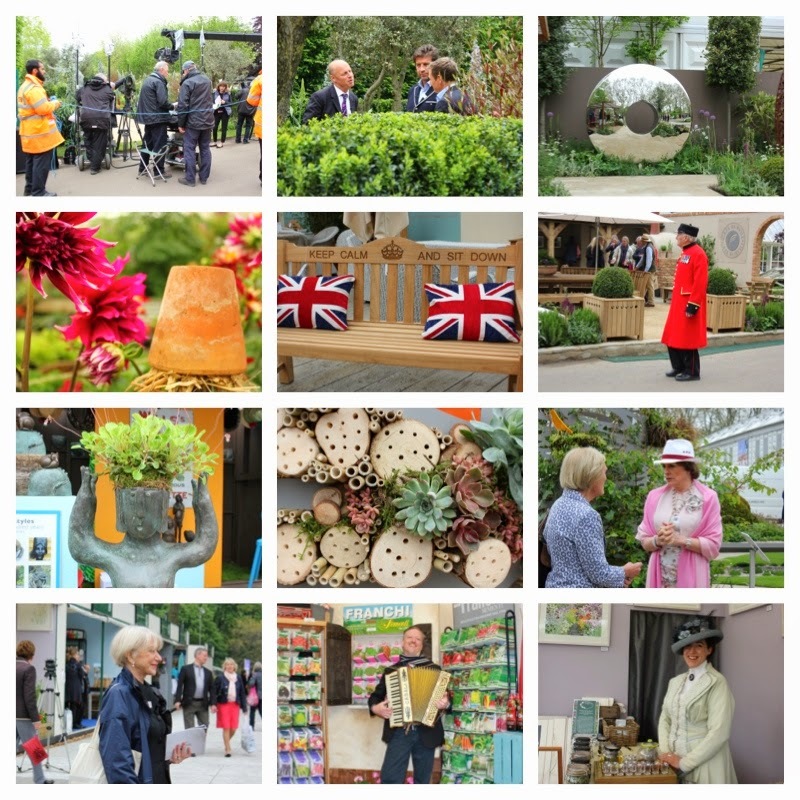 After spending a couple of hours sorting out my photos from the Chelsea Flower Show (post coming very soon! ), I wandered down to the veg patch on this beautiful sunny day. I've been a bit busy recently so I'm pleased to see that the garden is doing it's own thing and looking very lush without me (apart from a bit of watering and transplanting). As I uprooted a couple of tiny orache seedlings, the word 'lunch' popped into my head. I gathered a few more seedlings, added some white viola flowers and a few blue borage flowers, a pinch of herbs* - feathery fennel, lime mint, celery leaf, lemon balm (a mistake), sweet cicely (yum) and golden oregano (because the colour is stunning). Back upstairs, with the herbs and leaves being refreshed in a bowl of icy water, I picked a few outer leaves** from Lollo Rosso, Saladin and beetroot growing on my windowsills. On my tiny balcony, baby leaves of frilly red mustard, bijou lettuce, black peppermint, nasturtium (Blue Pepe, Empress of India and variegated Alaska, but sadly no flowers yet), coriander (yum), flat-leaved parsley and chives were collected and added to a wash bowl. As I cleaned and finely chopped, little pebbles of Jersey Royal potatoes boiled in a pan, after which they were glazed with Spanish olive oil, Cornish sea salt and garden mint. Many of these didn't make it to the plate - I adore warm new potatoes! ... no, needs a bit more colour. Into the fridge where I unearthed some cherry tomatoes and baby orange peppers. Nice. Until I found the ice-cream. * I wouldn't normally put this many herbs into one salad but was in the mood to experiment having just read Jono's post on Lemon Balm. With hindsight, adding lemon balm to this salad was every kind of wrong. I only put a tiny bit in and yet it still dominated. It's probably best to use it sparingly by itself where it can take the floor and shine. Parsley, cicely and chives on the other hand were delicious. ** I'm not yet brave enough to 'cut and come again', leaving the plant to reshoot. For now, I'm happy to just pick the large outer leaves with the comfort of being able to see what's still to come. Michelle over at Veg Plotting, who started the Salad Challenge, has written a great post on different ways of harvesting your home-grown salad. It could only be Chelsea! 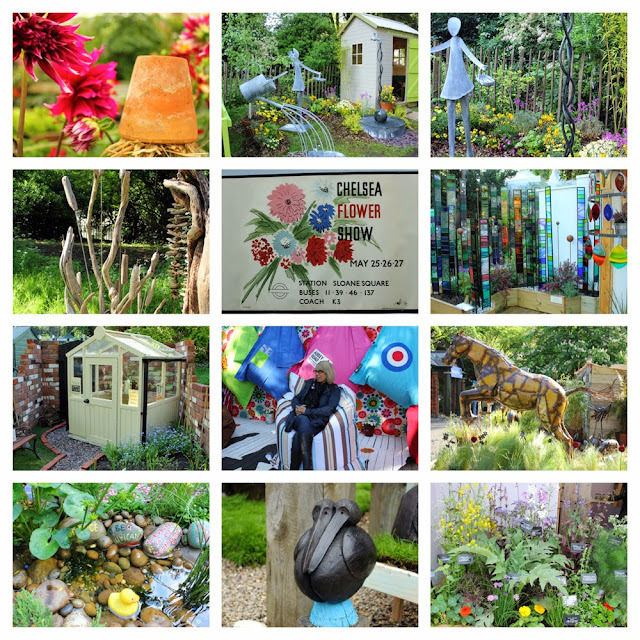 As my first year of garden design training draws to a close, I was determined to visit Chelsea Flower Show. It was an extraordinary new experience - I'm as passionate about ornamental plants as the next person, even though I focus on growing edibles - and Chelsea is deservedly the flagship show of the RHS. Comprehensive media coverage is fantastic for those that can't get to the show but the real thrill is to be there and experience the plants and gardens up close - and to have the time to linger and think, something a television show can't do. The weather can make a huge difference to enjoyment of the show and I struck lucky with a dry day of mild temperatures. 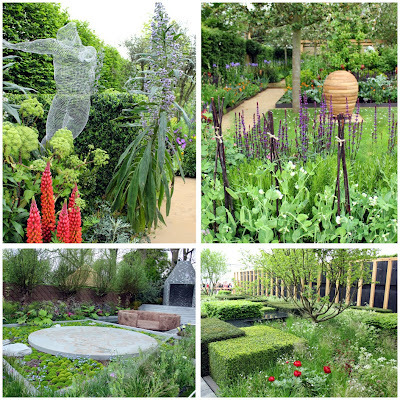 The designers must have been relieved as the gardens were shown to perfection and interviews in-situ were easier for not being rained on. It would have been possible to dash into the Grand Marquee, should the need arise, but that area was humming with people who'd come to see the exuberant plant displays. It was fun trying to match the designer to the show gardens; Christopher Bradley-Hole's style was very recognisable in his clever and subtle interpretation of the English countryside, as was Jinny Blom's innovative planting in the Sentebale Forget-Me-Not garden and Roger Platt's romantic cottage garden style. I wasn't expecting to see Homebase at the show (given their propensity for killing off plants in their garden centres) but Adam Frost had created a realistic and achievable edible garden for them; full of good ideas for incorporating edible plants into an ornamental garden, there was plenty to take away from here for the home gardener. 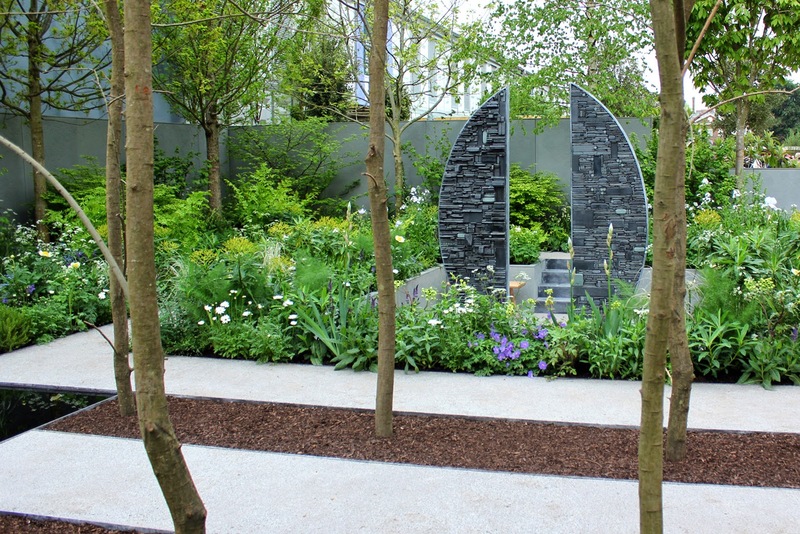 Chris Beardshaw's garden for Arthritis Research was beautifully layered in telling the journey of an arthritis sufferer and worthy of a longer look. It deservedly won the People's Choice award. The garden that I would award 'Most thought-provoking' to would be Jo Thompson's Stop The Spread; with half the space allocated to an avenue of dead trees, it's been designed to highlight the spread of pests and diseases that are destroying plants and trees in the UK. The contrast between the two areas of the garden certainly provoked comment - and, hopefully, further thought. 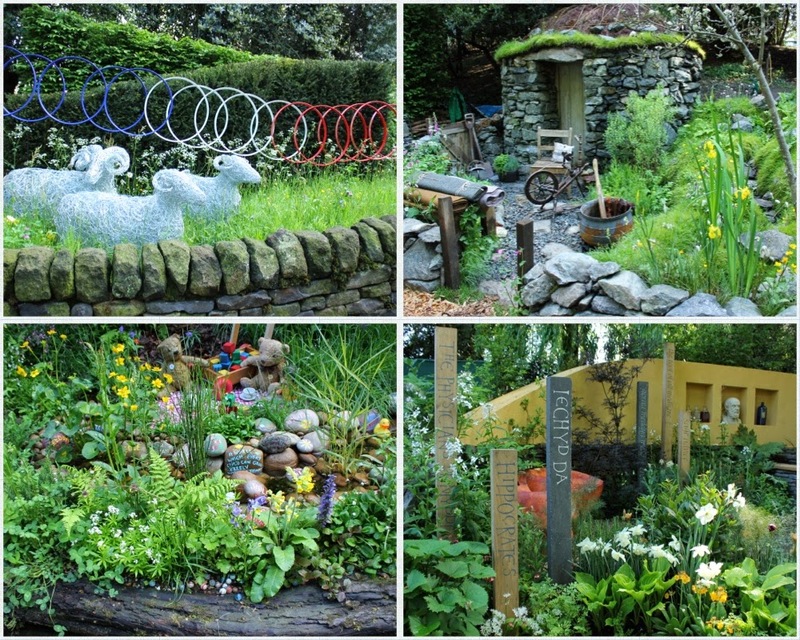 Clockwise from top left: Yorkshire garden, Hebridean weaver's garden, physic garden, NSPCC garden. 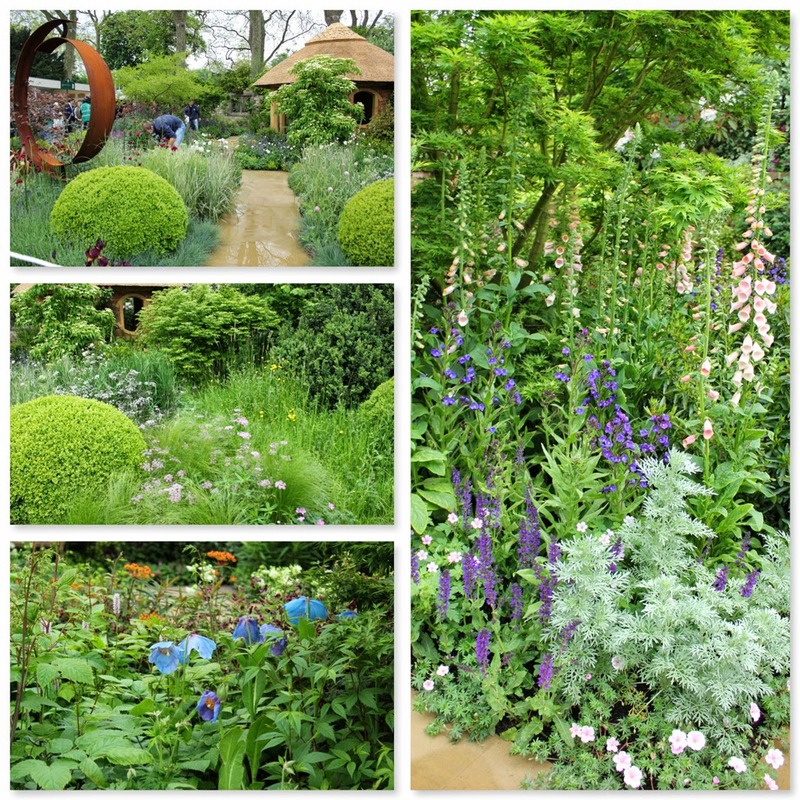 But out of all this extraordinarily beautiful and inspired planting, one garden that I had to see was 'Bird Columny', the Fresh Talent creation of three very talented students on my course at Capel Manor. The 'Fresh' area is where cutting edge designers can be showcased. The garden spaces are set around three laser cut columns and it was one of these that the Capel team were given to plant up. Thankfully my allegiances weren't tested as 'Bird Columny' (their exhibit) was a brilliant naturalistic salute to UK hedgerow plants and their benefit to wildlife. 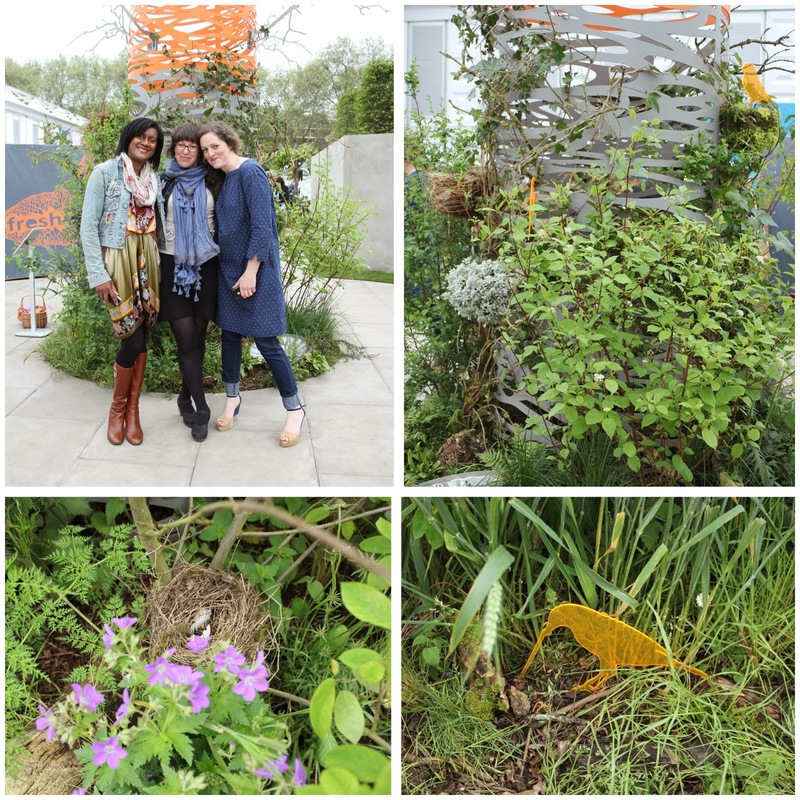 At the end of Press Day judging, the RHS agreed and the team - JAM garden design - was awarded with a Fresh Talent Gold. I know that the team, and Capel Manor who trained them, were thrilled with this achievement. As this was the first time of visiting the Chelsea Flower Show, I can't measure it against previous years, suffice to say that I found it enthralling. Talking afterwards to gardeners and media folk, I could tell that opinions were diverse. It was interesting to see how people's reactions to the show varied but I'm definitely good for a few more years of visiting this wonderful show. … And I haven't even mentioned the retail therapy! Two days ago, on popping down to the gardens, I was astonished by the sight of the blossom on the fruit trees. The warm sunshine had brought on a display that would have done a bridal florist proud. Waves of foaming white blossom graced both cherry trees; the apple blossom, although less prolific, was equally beautiful. Yesterday, as with the rest of the UK, we were hit by gale force winds. These have eased very slightly for today but I'm anticipating that there won't be much blossom left by the end of the weekend so I'm pleased that I took these photos for posterity. Only time will tell if the flowers were pollinated in time to produce fruit this summer. The pears and plums had already lost their blossom so I remain slightly hopeful of some of the trees producing. 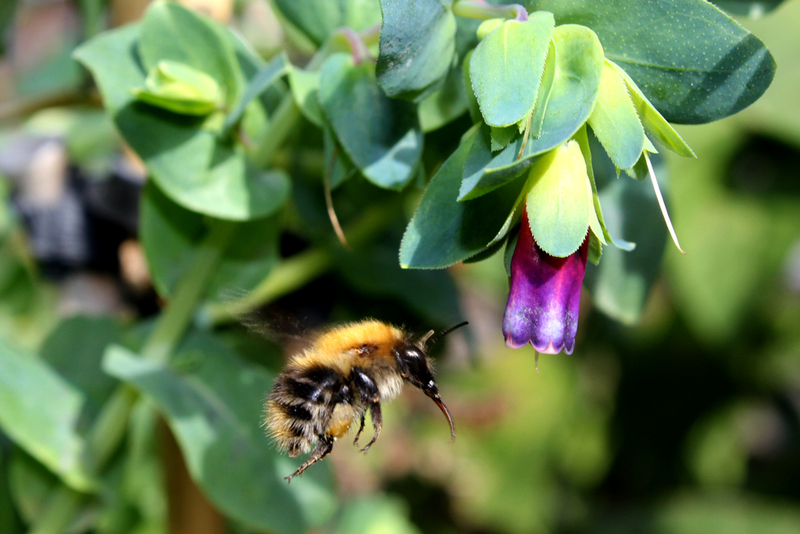 In my last post, the photo of Honeywort (botanical name Cerinthe major 'Purpurescens') flowering ridiculously early certainly generated a lot of comments. It turns out that this plant is a favourite with many folks and deservedly so. A comment left on that last post asked for advice on growing Cerinthe from seed saved last year. I have to say that it couldn't be easier. At this time of year (late spring), you can sow them outside, direct into finely raked soil. Water the soil first and cover the seeds with a bare quarter inch of soil. You can also do this in autumn (late September) to get them off to an early spring start. On the other hand, if you only have a few precious seeds, start them in small pots or modules indoors: soak seeds overnight to break down outer casing, sow at same depth of seed (about 2 - 3 mm deep) into free draining soil, wait 7 - 14 days for germination, let the seedling grow a bit before potting on; at about 3 inches tall, with 3 to 4 leaves, harden off and plant outside, leaving about 40cm between plants. They're a Mediterranean plant and their waxy blue-green leaves are a big clue as to where to site them - a nice warm spot with plenty of sunshine will suit them best and see them thrive. The soil doesn't have to be anything special, but must be well drained. Mine grow on top soil over London clay and usually reach about 50cm high. The stems can get a bit straggly in time and, as the drooping flowers are the whole point, it's quite nice to just support the stems a bit by staking, if you can be bothered. If you plant them closer together, they'll prop each other up but won't look as nice. They flower over a long period. If you're lucky, as they develop you'll get blue-green leaves with deep blue bracts surrounding a purple flower. 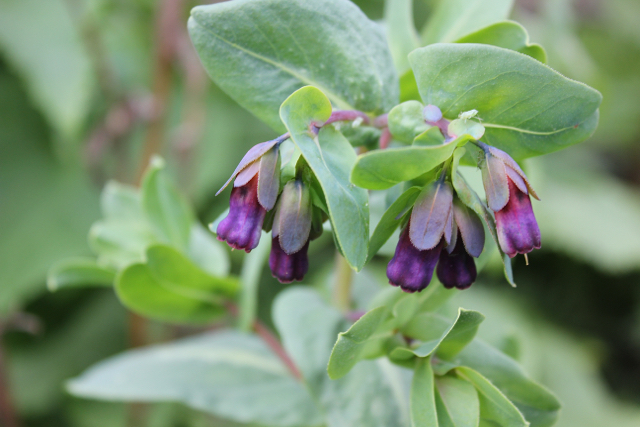 This isn't always the case though; I've had Cerinthe with grey-green leaves and pink flowers in previous seasons. Remember these plants are really good self-seeders; seedlings will pop up every year once you've had one plant in your garden. Every purple flower has two fat seeds inside; not all will germinate but it's a good precaution to collect the seed before it drops. Like Marigolds, etc, Cerinthe seeds can also be sown in the Autumn for earlier spring flowering. They are hardy plants and, once established, will pretty much cope with anything. Slugs don't like them. This is the first time that mine have come through the winter. The warm extended autumn of 2011 meant that I pulled the ropey looking plants much later than usual, giving the seeds time to drop. The cold and rain of 2012 meant that the conditions weren't right for germination until late summer so my plants were still relatively young by the time winter arrived and were left in situ. A few gangly sorry looking specimens were put out of their misery earlier this year but the healthier ones were left - and I have early spring flowers as a result. It's lovely to see as other self seeded flowers (nasturtiums, sunflowers, marigolds, orach) are only just beginning to get going. They're not edible but are a real magnet for bees as the purple flowers are a good source of nectar. They also make an interesting cut flower and will last better if you sear the ends of the stems in hot water for 30 seconds. Grow them with Escholzia (Californian Poppies), Atriplex rubra (Orach), Verbena bonariensis, Bupleurum rotundiflorum and Linaria (toadflax) for a colourful display. I hope this post has been useful and will inspire more people to grow these lovely plants. Seeds are available all over the internet, although they're unlikely (but not impossible) to be found in garden centre or supermarket seed racks. 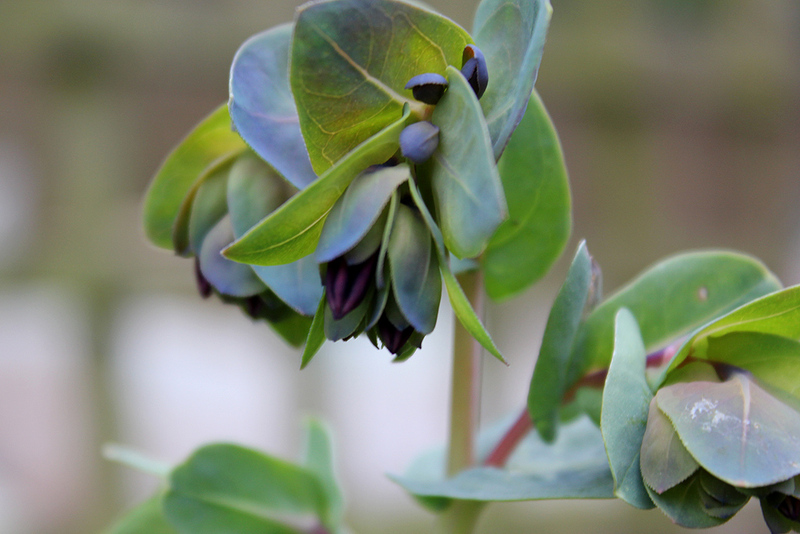 I started my Cerinthe stock with one small plant bought from Sarah Raven's nursery at Perch Hill and saved the seed each year thereafter.